see bottom story from New Mexico. The hiker who went missing on Mount Hood in late August and was found dead at the bottom of a ravine Monday was likely killed by a cougar, authorities said — a shocking twist in the missing persons case. The body of Diana Bober, 55, was found Monday at the bottom of a 200-foot embankment on the famous Oregon mountain’s Hunchback Trail, the Clackamas County Sheriff’s Office said Tuesday. Bober was last seen on Aug. 29 when she went for a hike on the trail. Her backpack was found by two hikers on the following day and her car was left in a parking lot at the base of the mountain. The body of 30-year-old William Lee Hill Jr. of Louisville, Tennessee, was found Tuesday afternoon two miles north of Cades Cove off Rich Mountain Road, according to a news release from the Great Smoky Mountains National Park. An adult male bear remained in the area where Hill’s body was found and showed aggressive behaviors for multiple hours as rangers recovered Hill’s body throughout Tuesday evening, the release said. Evidence of wildlife scavenging of Hill’s remains was visible. Wildlife biologists reportedly came to the area, trapped the bear and recovered human DNA from it, the release explained. At that point, park officials said they decided to humanely euthanize the bear out of concern for public safety — but on Friday it was revealed the bear had not, in fact, been euthanized yet and was fitted with a GPS tracker. The grizzly bears suspected of fatally mauling outfitter Mark Uptain were trapped and killed early Sunday near the elk carcass that caused conflict on Terrace Mountain. 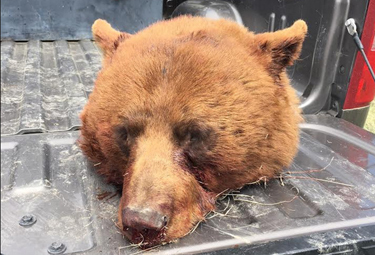 [W]ildlife managers are not releasing all the details about what they believe occurred when Uptain and his bow-hunting client, Corey Chubon, were aggressively attacked by the pair of bruins Friday afternoon. Hovinga surmised that the bears involved were a sow and its grown cub. Chubon, who was airlifted out of the Teton Wildness with leg, chest and arm injuries, reported to investigators that of the two grizzlies involved, only one was the aggressor. The Florida resident, who flew back home Saturday, told authorities that he was unable to fire a shot from a handgun he retrieved during the attack, but he threw the firearm to Uptain before departing the scene. Late Saturday, Hovinga declined to discuss evidence collected at the scene, but he did say that bear-deterrent pepper spray was among the things the guide and client possessed. He said he “didn’t know” if the handgun was with Uptain’s remains. The gun was not recovered immediately around where the attack took place, at the site of an elk Chubon had struck with an arrow Thursday. The guide and client did not locate and start to retrieve the elk until early the next afternoon. 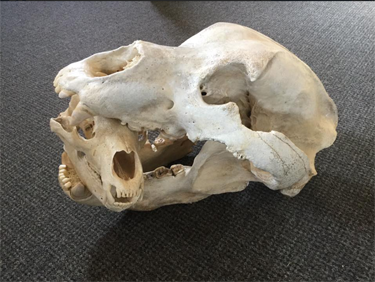 The elk carcass was “undisturbed” when it was located by Uptain and Chubon, which suggests that the bear was not necessarily food guarding — a common behavior that often leads to conflicts with humans, especially hunters. When a New Mexico hunting guide reportedly found himself the target of a bear, he dropped his phone and reached for his pistol. It would turn out to be one of the best decisions he ever made. An earlier decision, though, threatened to cost him his life. He’d been working out his dogs in preparation for the upcoming hunting season when they’d struck a bear’s trail. The only way to put an end to that was to catch up with his dogs, so he pursued, with family members following. As he approached the fight, he grabbed his not-fully-loaded pistol as he left his UTV. As an afterthought, he took the GLOCK 20 10mm pistol from his vehicle and shoved it in his waistband behind his cowboy belt. It was loaded with 175 grain Hornady Critical Duty FlexLock loads. The magazine only had 10-12 rounds in it. A few months earlier, he had heard the theory of “spring set” and decided not to keep the magazine fully loaded. He approached the melee, expecting the bear to run at the sight of him. And when he spotted the bruin, he grabbed his phone to take some video of its unusual cinnamon coloration. But the bear had other ideas. Bridger’s first thought was to get video. It would be an incredible image. Big cinnamon bears aren’t common. The bear would run at any moment, once he saw or smelled the man. Bridger grabbed his phone. That bear never read the rulebook. It didn’t run. The bear saw Bridger, turned toward him, and flattened its ears back along its head. Its eyes had locked on Bridger. He’d watched hundreds of bears in similar situations and he knew he’d been targeted. He dropped the phone and snatched the GLOCK from his belt. A lot happened very fast, but for Bridger, everything slowed down as he went into tachypsychia. It’s a common occurrence in high stress life-or-death situations. The mind speeds up and events appear to be happening in slow motion. In reality, the person is acting faster than they ever have before. The bear was coming for him. Bridger elected not to aim for the head. He didn’t want to hit one of his dogs. He triggered two or three shots aimed at the bear’s body. The bear started to spin, snapping at the wounds, about six feet away. Bridger decided to retreat. He turned and hopped to the next boulder, then the next. He was mid air to the third when he saw dogs moving past him. In his fast mind-state, he realized this was bad. As he landed and turned, the big GLOCK in his hand, and saw the bear coming at him like an over-sized NFL linebacker with claws and big, pointy teeth. Before he could fire again, the bear hit him. They went over the edge of the shelf together, tumbling down a steep, rocky slope in mortal combat. Although he has no memory of shooting as they fell, empty shells were later found along the path of their descent. Bear and man stopped downslope, wedged into brush and boulders. Bridger could feel the bear and frantically attempted to disentangle. The bear reared erect, jaws ready to strike. Bridger shot him again, in the front of his chest before falling/sliding further down the slope. The bear pursued him. He screamed at Janelle to stay away. Bridger tried to kick the bear away from him as it tried to get at his upper body. He couldn’t shoot for fear of hitting his own legs. The bear dodged a kick, and grabbed Bridger’s right inner thigh in its jaws, lifting him like a dog lifting a rabbit. Bridger shoved the muzzle of the GLOCK against the bears neck, trying to shatter its spine and shut the bear down. He fired. The bear released his lower thigh, then grabbed his calf, just below the knee. The shot missed the spine. Man and bear are still moving fast, but in Bridger’s hyper-aware state, time slowed. He saw an opportunity for a headshot and pressed the trigger on the GLOCK. Later, Bridger found bear hair between the guide rod and the slide of the G20 pistol. The hair prevented the slide from returning into battery. Bridger knew he should still have ammunition left in the magazine, so he racked the slide and saw a live round eject in slow motion. Fractions of a second later, another opportunity for a head shot presented itself. The bear ripped at his leg. 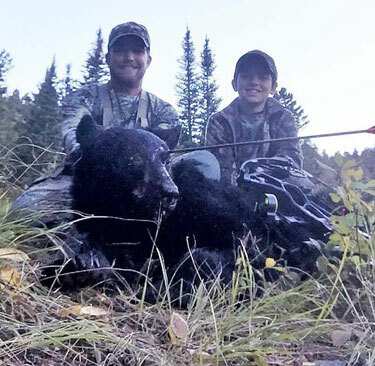 As the bear tried to tear off his calf muscle, Bridger saw his chance and pressed the trigger. Man and bear went down together, rolling and sliding a bit further down the slope. Although the bear was dead, its teeth were still hopelessly tangled in Bridger’s calf muscle. When rescue personnel arrived — quickly, thanks to his family’s close proximity at the time of the attack — they struggled and failed to free the meat from the fangs. Only after cutting the bear’s head off with a pocket knife could they transport Bridger and his now-gray leg muscle. * Antigonus in Winter’s Tale, Act III, Scene 3. 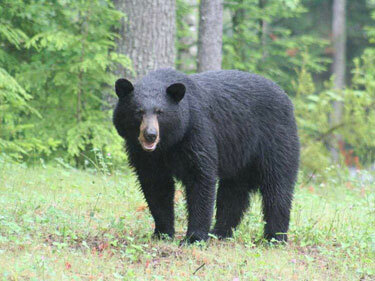 It is a standard hazard of life in Appalachia that, in mid-to-late April, Ursus Americanus, the native, killed-off-by-the-pioneers-but-returned-by-the-conservationists Black Bear wakes up hungry from his winter slumbers and embarks on a temporary annual reign of terror, leaving no bird feeders or garbage cans left outside safe. 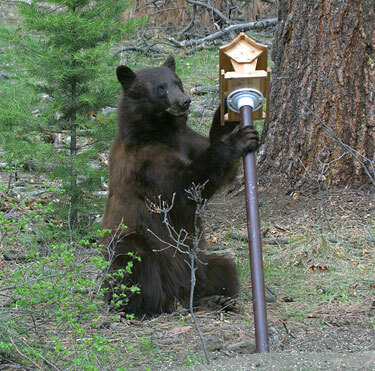 It must have been a young, apprentice bear who showed up Tuesday night. He could not bend the pole reinforced-with-rebar that holds up two feeders, and he was also foiled by the sturdy pipe holding the much-bear-destroyed-and-then-always-repaired ancient red feeder that predates our 30-year ownership of the farm. He merely bent down the un-reinforced, limber pole, pushed open the bottom of the tall, tin feeder with his nose, and inhaled its sunflower seed contents. He must have taken bear lessons before he returned Wednesday. The rebar-reinforced pole was bent. The pipe pole was pushed so hard that its cement base was tilted out of the ground, and a piece of board from the bottom of the old red feeder was artfully removed. Every single feeder was emptied. All this criminal activity on Tuesday and Wednesday nights took place discreetly late at night after the humans and dogs had gone to bed. Last night was different. Karen and I were sitting here, around 9:30, watching a movie on tv. The ten-month-old Taigan puppy was outside exploring. Suddenly, the door flew open, in came the puppy who ran all the way across the room to a position of comparative safety on the stairs at the far end of the room before he began barking. This puppy has been notoriously unperturbable. Nothing has seemed to intimidate him previously. Certainly, not me. Not even his older brother, Uhlan, who once sent him to the vet for stitches. So, I got up, took the loaded Model 629 from the bookcase by the door, stepped outside and applied a little .44-caliber fumigation to the general vicinity. Amusingly, both dogs were still leery and looking around carefully last night and again this morning. There was one small (mildly appalling) denouement. This morning the puppy was out running around for the second time, and after a bit came trotting down the slope from behind the cabin with something black in his mouth. “He’s playing with another black walnut from last fall.” I thought. But, no, he sat down, and I saw it was too large. He had found himself, and was dissecting and devouring, a black bear turd. Avon [Connecticut] residents called police after a bear tried to get into a home this weekend and one neighbor got the whole incident on camera. Neighbors talking to 911 dispatch stated that the bear was trying to gain access into a home on Stagecoach Road. “My neighbor across the street just came over in a panic. She’s a little old lady, screaming that a bear got on the back porch and is slamming on her glass door,” one call to 911 stated. Members of Department of Energy and Environmental Protection were not called to the scene. 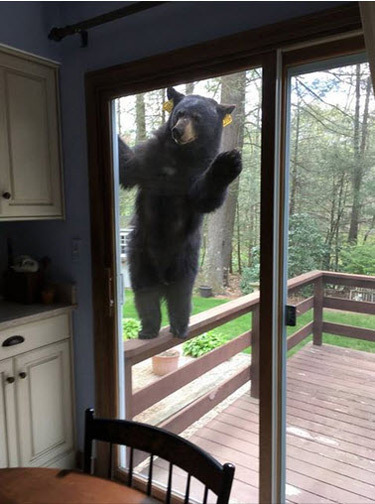 They said a bear “spent considerable time on a deck and was reluctant to leave.” This incident was especially terrifying for the female homeowner who was baked brownies as the bear pressed up against her glass door. “We have a bear attempting to get into a house and he’s not afraid of noise, screaming or yelling or pounding,” Avon resident Bob Belfiore said when he called 911. DEEP said a neighbor, who was later identified as Belfiore, rushed to help his neighbor get the bear to go away. The animal made its way onto the deck’s railing before standing up and peering in. At one point, the bear was able to open up the screen door, but thankfully couldn’t manage to open the glass slider. 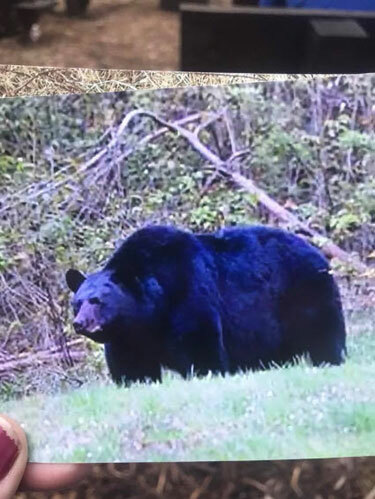 Belfiore told Eyewitness News this bear was persistent. Avon police did head up to the house after getting the 911 calls, but the bear had already left the area. There were no reported injuries. “It was a rather harrowing experience although it looks cute in the photos,” Belfiore said. This is a remarkable sub-species of the North American Black Bear. 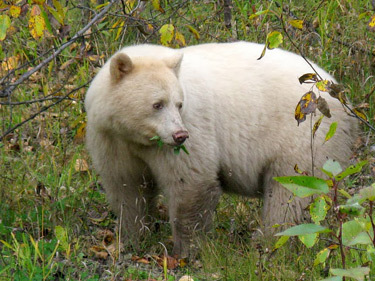 It is the Kermode Bearr – also known as the spirit bear. Pronounced kerr-MOH-dee, the lighter Kermode bears are not albinos. They appear much brighter than most of the population because of recessive alleles. Russel Ferster is one heck of a bow shot is all I have to say. Ferster was hoping to put his archery skills to good use September 11, 2016, but not on a bear, and certainly not in a life-or-death situation. He and his 11-year-old brother, Lane, were elk hunting in Montana’s Crazy Mountains when a black bear responded to their cow call. “We weren’t even fifteen minutes out of the pickup and I decided to cow call twice,” Ferster told the Billings Gazette. The bear burst from nearby cover and closed to within 15 yards in an instant. Ferster said it appeared to be after the “elk” and not after he and his brother. Ferster has had this occur before while elk hunting, so he raised his hands and shouted at the bear as he had done in the past. This bear, however, wasn’t deterred. The bear began pouncing up and down on its front legs, much like a grizzly does when it presses down on a recently killed animal. Ferster is used to dealing with grizzlies, too, so much so that he has quit hunting in several areas that held the bigger bears. But despite his usual caution, he had failed to bring either a handgun or bear spray with him on this elk hunt. He drew his bow in readiness for a possible attack, but his movement caused the bear to surge toward him. That place was the eye. His arrow met the bear’s left eye, driving inward and upward through the bear’s head. It dropped the bear almost at Ferster’s feet, the broadhead lodged just inside its skull and the nock touching Ferster’s leg. 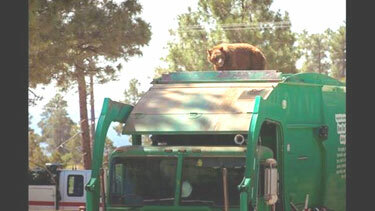 Garbage truck driver in Los Alamos, New Mexico finds a way to allow the bear riding his truck to make his exit. Not unlike the scene just outside our window last night. Around 10:15 PM EST, Karen and I had just finished watching Vincent Price hamming it up in House of Seven Gables (1963), when our saluki (who had already had his last outside call for the evening) was found peering intently out the window. Outside the window were three bird-feeders on poles standing in a small clearing and our dog had previously detected an opossum visiting at night to mop up fallen seeds lying on the ground. He had developed a real enthusiasm for that possum, and kept looking for him weeks after the varmint had been last seen. Last night, though, Uhlan was looking out the window so intently that I suspected his beloved possum had finally returned. Karen went over to the window and looked, and saw that two poles were bent over and two rifled feeders were lying on the ground. She retrieved the flashlight from the other end of the room and handed it to me. When I aimed the light out the window, the culprit was visible. It was a fully-grown black bear, sitting about ten feet from the house and looking guilty. This was not the first time that bears had raided our birdfeeders. I had previously vowed revenge, and I had a .44 Magnum Smith & Wesson all ready for just such an occasion, sitting on a bookcase near the door, its first two chambers loaded with ratshot. Sigh! What can you do? I’d been looking forward to applying a load of number 12 ratshot where it would do the most good, but wives are wives. I contented myself with opening the door and firing a shot out into the (empty) front field. The loud report and the flame (visible at night) issuing from the barrel naturally made some impression of Mr. Bear, who (as Karen who had been watching, reported) levitated out of the area in great haste. Previously, one or another bear had absconded with two feeders, which were not seen again or found long afterward totally destroyed. This time, we recovered all the feeders fully intact, and one of them was even still full of sunflower seeds. the Archives of Never Yet Melted in the 'Black Bear' Category.